This design for a Sizaire-Berwick advertisement may or may not have been published (it appears in a printing annual as an example of excellent “Line Advertisement Design”), but it is equally as elegant as the many others created by this company during its existence – from 1913 to 1927. The most striking aspect of the illustration is the identity of the artist – not normally associated with such patrician vehicles or their subtle, upmarket promotion. If you want to guess who it was, then try to avoid looking at the answer until right at the end. The Sizaire name in connection with cars had a complex history. Maurice and Georges Sizaire founded the Sizaire-Naudin company in 1903. Their cars were characterised by single-cylinder engines and independent front suspension by transverse leaf spring and sliding pillars. The gearbox was unique – consisting of an integral 3-speed differential with three pinions brought to bear in turn on a single large crown wheel. The Sizaire brothers left the Sizaire-Naudin company in 1912 after disagreement with an investor, and the company continued to make cars until 1921, by now with four-cylinder engines. But the Sizaire brothers did not leave the industry. In 1913 they teamed up with Frederick William Berwick, the London-based UK importer of the Corre La Licorne marque, and launched the Sizaire-Berwick company to produce large luxury cars. Chassis were produced at the factory in Courbevoie near Paris, but most production was sent to England to receive bodies – mostly by Berwick’s own coachbuilder in Highgate, North London. 139 cars were produced before war broke out. In 1915, Berwick built a new factory at Park Royal, a London suburb. In 1919 Berwick founded F. W. Berwick & Co Ltd and in 1920 started production of British-built Sizaire-Berwicks. These continued to be made until 1925. The radiator on the car in this Snapshot is a later development. Early pre-war cars had a radiator almost indistinguishable from that of a Rolls-Royce – and almost certainly somebody “had a word” with the company, with post-war cars sporting the stylish V shape seen until the end in 1927. By the end of 1922, the Sizaire brothers were busy with the new Sizaire Frères car, powered by an advanced 1,993 cc 4-cylinder overhead-cam engine and featuring independent suspension on all four wheels, while Berwick was involved with another luxury car called the Windsor. But Sizaire-Berwicks continued to be built in small numbers at the Courbevoie factory until 1927. And the artist of our Snapshot illustration? 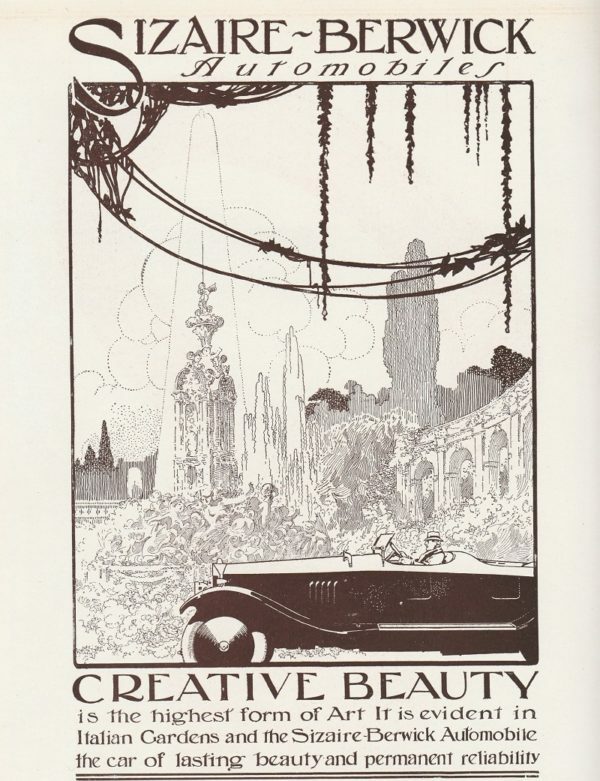 None other than Charles Heath Robinson. Perhaps the dangling fronds are about to lift the car up and use it to water the gardens. Or perhaps not.